We present the reports from a number of student projects. These summer research projects were completed by year 11 students working at Saltire Software as part of the Saturday Academy's Apprenticeship in Science and Engineering program. The aim of this investigation is to study the caustics (curves formed by reflected light) of the paraboloid by modeling its xy-plane curve (a parabola) and to explore the effects that light angle, curve diameter and curve depth have on aberration (inability to focus). Parabolas are popular curves used for solar concentrators because of their ability to reflect incoming light parallel to the central axis to a single focal point. However, parabolic curves are inefficient when the light is not parallel. This paper investigates another possible curve, the circle, and explores the efficiency of the circular solar concentrator at incoming angles not parallel to the central axis with mathematical models created by Geometry Expressions. The parabola is commonly used as the curve for solar cookers because of its ability to reflect incoming light with an incoming angle of 90 degrees to a single focus point. However, because of this very specific property, the parabolic solar cooker must constantly be realigned for maximum effectiveness. This project explores whether there is another curve that is more accurate at wider angles than the parabola. Many large-scale watering configurations for farming are done with circles because of the circle's practicality, but a circle obviously cannot tessellate a plane, nor do they fit very well in a rectangle. Unfortunately, most plots of land are rectangular. In this paper, we use Geometry Expressions to investigate the optimal method of placing circles. In this paper, we use Geometry Expressions to investigate the largest sector that can be placed in a right triangle. We make a list of 26 possible cases, and proceed to eliminate ones that cannot possibly be optimal. 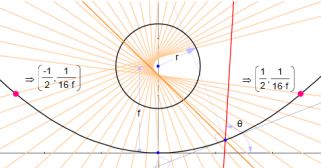 In the end, we find that the largest such sector is centered at the smallest angle and tangent to the opposite side. In a triangle with angles A, B, and π - A - B, we draw three sectors centered at each vertex, each with maximal angle, and then maximal radius. Using Geometry Expressions, we look for the largest of the three sectors for all possible triangles. This paper takes the everyday activity of soccer and uncovers the mathematics that can be used to help optimize goal scoring. The four situations that are investigated are indirect free kicks, close up shots at the goal with curved and straight kicks, corner kicks, and shots taken from the sideline. The purpose of this investigation was to discover if catenary solar cookers can be used as a cheap alternative to parabolic or circular solar cookers. I modeled a catenary solar cooker in Geometry Expressions and used Maple to calculate the percentage of light rays that reflected into a specified radius.